1-1/2 c flour; 1/2 c raw sugar;1/4 c unsweetened dark chocolate cocoa powder; 1/2 tsp. baking powder; 1/2 tsp. 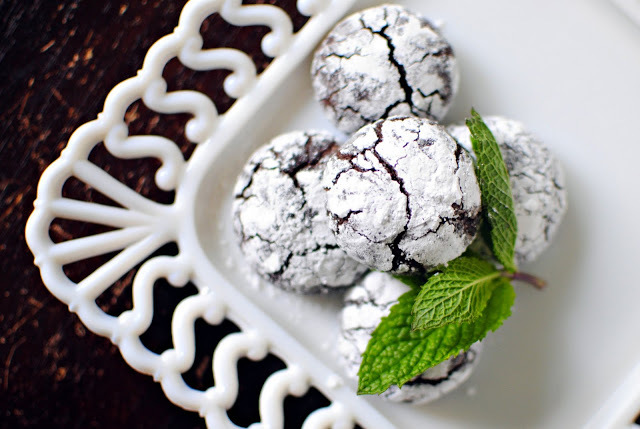 sea salt; 1/2 cup loosley packed chocolate mint leaves and 1/2 c pepermint leaves ( you can use dried herbs, just use 1/2 amount as fresh); 1 c Semi-sweet choc. chips; 3eggs, lightly beaten; 6 tbls. unsalted butter; 1 tsp Vanilla extract(organic); 1/2 c raw sugar and 1/2 c powdered sugar( for rolling the cookie dough.